A total of 3,090 Bikini models showed up at Longwan beach, Huludao city, on Wednesday morning. As the largest Bikini show, the event has created a new Guinness world record. All the models are local residents in Huludao, including professional models, anchors, students, officers, volunteers from communities and Bikini fans, who all wore local-made Bikinis. An officer from the headquarters of Guinness based in the UK witnessed the history-making moment with more than 10,000 audiences on site. 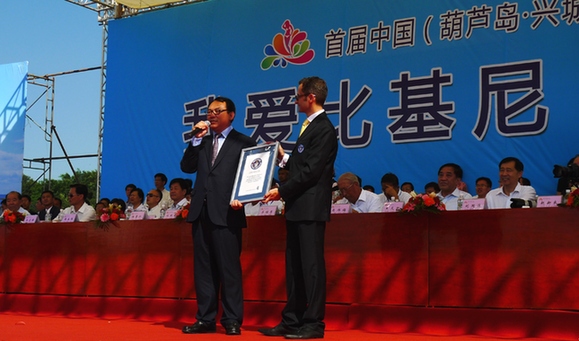 Du Benwei, deputy CPC secretary of Huludao and acting mayor of the city, accepted the Guinness certificate on behalf of all the residents of Huludao. Bikini is a kind of culture, fashion, as well as a healthy lifestyle. Before the new record was created, the old Guinness record was made in Russia by 1,900 Bikini wearers. Titled "I love Bikini," the event was one of the major events of the first China (Xingcheng, Huludao) International Swimsuit Festival held in the city on Tuesday and Wednesday. Other events of the festival include a swimsuit model contest, a design contest, a conference on investment and trade, a beach volleyball game, and a mass Taiji (Tai Chi) performance accompanied with the music of Chinese zithers.